The Boys are now being used to alert people of hazardous situations with maximum visibility. 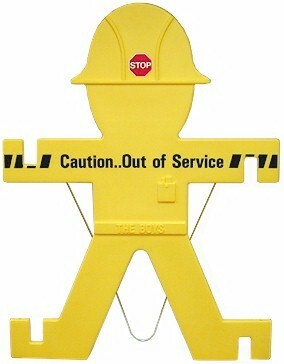 This individual free standing Boy warns: Caution ... Out Of Service. The Boys give you 1271 square inches of visible warning, 80% larger than the standard tent sign, being 31 wide by 41 high. If you need The Boys as a solid wall temporary maintenance barricade, just join them at the hands, as the wire stand on the back will not interfere. Two maintenance uses within one product.